Le Thi Lien recently told Vietnamese reporters that she was so amazed by Bin’s ability to recognize and pronounce 11 in English that she took the calendar and showed him other numbers to see if he recognized them. To her surprise, the toddler recognised and pronounced all the numbers from 1 to 30 in perfect English. After that, she went out and bought him the English alphabet, as well as coloring books and children’s exercise books in English. Today, at age 5, Bin can read in English, can name the English term for virtually any item, but is only learning to speak Vietnamese. In her interview with Vietnamese media, Bin’s mother could barely hold back her tears when asked how she communicated with her son. She didn’t speak any English and he didn’t speak Vietnamese, so in the beginning all they had was sign language. “I do not understand, I would shake my head and say ‘I don’t know,'” the woman said. But she couldn’t let things stand, so she started learning English. Every night, despite coming home tired from work, Le went online and took basic English lessons, wrestling with the different grammar, pronunciation and even letters. It took a while, but she was eventually able to communicate with him. Kindergarten was a tough experience, because Bin didn’t understand Vietnamese and also complained that the teacher spoke English incorrectly during English class. His mother talked to teachers at the Foreign Language Center, who, after testing Bin, said that his skills were advanced and he needed to study at an English school in a big city. So she took him to a school in Ho Chi Minh City, where a native English speaker gave the boy a 49-question questionnaire, and he answered every question right. 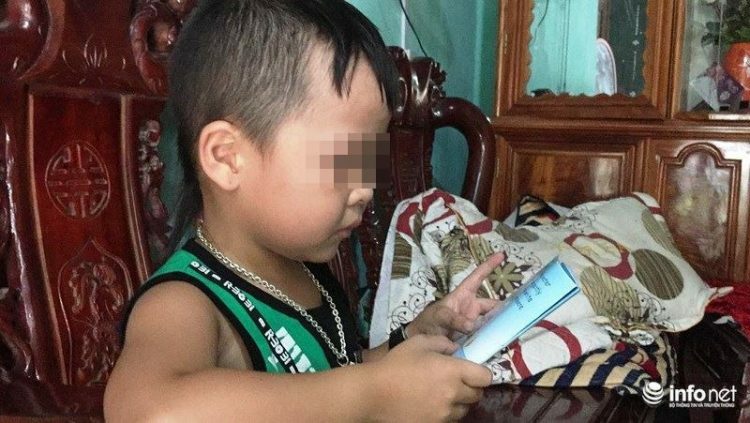 The English teacher praised the boy and welcomed him at the school, but the monthly tuition was 7 million Vietnamese dong ($300), which Le Thi Lien simply could not afford. Luckily, Bin also started learning Vietnamese at the beginning of this year, so he and his mother can now communicate a little better. He’s still much better at English though, and his mother hopes to somehow help him take advantage of this amazing ability. Interestingly, this is not the first such case we’ve reported on Oddity Central. Back in June, we wrote about Mahmoud O’Neal, a 3-year-old boy from northern Israel who spoke fluent English without ever having studied it.